WHAT a fine rabbit!" 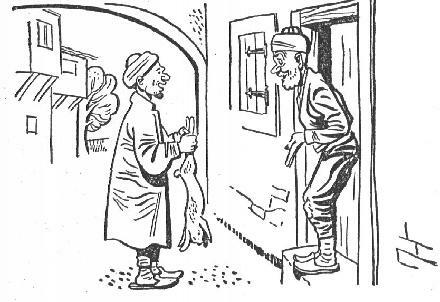 Nasr-ed-Din Hodja smiled as he took the plump rabbit that Hussein, the villager, held out to him. "I caught it especially for you!" Hussein's smile was as broad as the Hodja's own. "Fatima! Fatima!" called N asr-ed-Din Hodja. Pulling her scarf over her face, Fatima came bustling in from the kitchen. "See what a feast Hussein has brought us!" The Hodja chuckled in anticipation of the good meal, as Fatima held out her hand for the limp rabbit. "I am asking him to stay and eat it with us. Cook it your very best!" Left alone, the two men sat cross-legged on the floor and talked - at least, the Hodja talked and the villager listened. The Hodja knew it would be nearly two hours before the meal was ready, but what better way to pass two hours than to have a quiet listener? Nasred-Din Hodja's voice droned on contentedly. There were stories of his childhood, of his school days, of his exploits at the court of Tamerlane the Great, of the everyday news of his own city of Ak Shehir. There were his views of this, and that, and the other. Hussein, the perfect listener, knew just when to shrug his shoulders, to click his tongue, to wag his head, to rub his hands together. The pungent fragrance of roasting rabbit floated about them. At last the door opened and in scuffled the veiled Fatima with a huge tray of rabbit and pilaf and a big plate of thin bread. She set the food between the two men and went scurrying back to the part of the house where a woman belonged when there were guests. Breaking off bits of bread, the men curved them into spoons and scooped up great mouthfuls of the steaming pilaf and rabbit. "What a cook!" sighed Hussein. There was just the right touch of garlic, just the right sprinkling of pistachio nuts, just the right dryness of the rice. "What a rabbit!" mumbled the Hodja, his mouth full to dripping. They ate until their loose girdles were as tight as drumheads. They polished their plates with their bread to get the last succulent bit. "There are still the bones left!" Nasr-ed-Din Hodja's voice was drowsy and contented. "Fatima's soups are as good as her pilafs." Home to his village went Hussein, reporting to his neighbors how royally he had been treated at the home of Nasr-ed-Din Hodja. The next morning, the Hodja was called to the door again. There stood two villagers - strangers. Remembering his treat of yesterday, the Hodja glanced quickly at their hands. Empty! "What is your errand?" questioned the Hodja. "We are the neighbors of the villager who brought you the rabbit yesterday." The men looked expectant. They seemed to be sniffing the air, which was already telling of the soup Fatima was preparing. "Oh! A fine fellow is Hussein!" cried Nasr-ed-Din Hodja. "Hosh geldiniz - your coming gives joy. Any neighbors of his are welcome. Come in! Come in! Dinner will soon be ready and you shall see what good soup Fatima can make of the bones of the rabbit. A great cook is my Fatima!" Fatima, hearing the voices, padded softly into the room and peered through her veil. As she left the room, there were sounds behind her veil which might have meant, "What fun to have guests again." Or the sounds might have meant something very different. Soon Fatima brought in a tray with three steaming bowls of soup, thick with rice and vegetables and tiny shreds of rabbit meat. She set the tray before the three men and slipped out of the room. The Hodja talked as he ate, but his stories did not flow with yesterday's enthusiasm. The men thanked him for the meal and went back to their village, to tell of the hospitality of Nasr-ed-Din Hodja. The next morning, the Hodja went warily to answer a knock at the door. There stood two other villagers - strangers again. "And why am I honored with this call?" Nasr-ed-Din Hodja had already glanced at their hands and found them dangling empty at their sides. "We are the neighbors of the neighbors of the villager who brought you the rabbit." The two men grinned hopefully. Nasr-ed-Din Hodja blinked, then said, "Come in and share my humble meal." The men walked in and squatted on the floor while the Hodja went into the kitchen. He poured a kettle of hot water over the spoonful that remained of yesterday's soup. He poured the liquid into bowls which he carried to the room where the men were waiting. "Oh neighbors of the neighbors of the villager who brought me the delicious rabbit!" Nasr-ed-Din Hodja's cordiality was loud. "May you enjoy this soup of the soup of the bones of the rabbit." One neighbor of the neighbors of Hussein looked at his bowl of water in which two grains of rice swam beside a scrap of turnip. The other neighbor of the neighbors of Hussein looked at his bowl of water in which two grains of rice swam with a shred of onion and a chip of carrot. Nasr-ed-Din Hodja made a great noise of emptying his bowl before he smiled his guests to the door. And the next day Fatima and Nasr-ed-Din Hodja sat down to a quiet meal together once more.